This 9mm Luger ammunition from Federal is a favorite range staple of many shooters due to its consistent quality, reliability, and low cost. 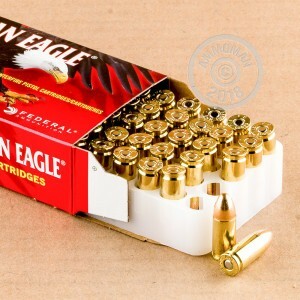 Packaged in a 1,000 round case, these cartridges fire a 124 grain full metal jacket bullet that has similar ballistics to many popular self-defense loads and serves as an excellent low-cost alternative for target shooting. This is a 9mm Parabellum standard pressure load suitable for use in both full-size and subcompact pistols. 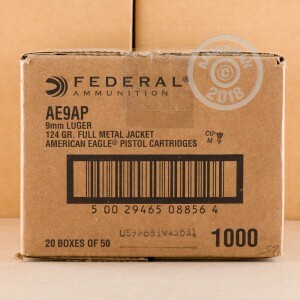 If you're looking for ammo by the case, AmmoMan.com is the place to be. 500 and 1,000 round cases like this one (along with all orders over $99) qualify for our free shipping promotion, which means double-digit savings for you. American Eagle 9mm 124 grain FMJ is the perfect practice round for my self defense round; Federal Premium 9mm 124 grain HST JHP. Same recoil, same consistency and never a squib in either format. Add to that the fine folks at Ammoman and you have a winning combination. Excellent service and a great product. Arrived on time, great communication, will reorder. Arrived on time, great communication, will reorder & recommend to friends. Great ammo for a good price. Whats not to like. Can't go wrong with this ammo. Excellent ammo at a great price. Definitely plan to order all future ammo from this business. Discount prices are unmatched. I have shot hundreds of these rounds without a jam or miss fire in several of my guns. Thanks ammoman for making ammo purchases easy! Have shot 400 rounds and so far no issues. All is as it should be. Great price and good ammo for honing your shooting skills. Love this round. Tight patterns, cycles my Sig P320 very well. Great value when offered on sale. Product is clean and reliable and I use it weekly at the range. I was very surprised and happy with the speed of shipment and accuracy which was greatly appreciated. Will definitely order again. 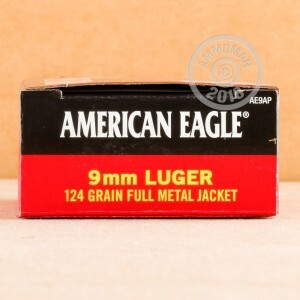 I use this Federal American Eagle 124 grain ammo in my new full size 9mm Glock 17. To date I have fired 1200 rounds on this ammo at the range. I have had no misfires, jams or any other complaint with this ammo. It also is fires very clean. I will try the 115 grain version next. Took a six day instructor class at CSAT in TX . My ammo shipped on time . I had zero issues, service on the phone setting up when and how to ship was super. Shot 200 rounds through S&W shield abd glock 17. All fed well no misfires. Great place to purchase ammo, great service extremely happy. Best price for a great range load, fast shipping, need to order more. GREAT PRICE - EXTREMELY RAPID DELIVERY - ERIC HAS A WINNER! Ordered a case and it arrived two days later! Was cheaper than any 124GR 9mm out there and feeds, fires and ejects great. You can't beat Ammoman prices or delivery with a stick! Keep up the good work. I went through a full box over the last few months. No FTF or FTE, fairly clean too. Also matches the ballistics of their HST personal defense rounds. Great service from AmmoMan, placing my order for the next case now. Great quality and even greater price, highly recommend. Arrived very quickly and in perfect shape. Excellent value and product. Searched many places and the best price was right here. Superb transaction for a dependable, clean shooting ammo. This was my first time buy for ammo online. Selection was great, price was even better and delivery was so quick. At the range the ammo was flawless. I know now where to look first for my ammo needs. Ammo was as expected, packed well & at a great price. The quick door to door shipping is a bonus. Shot aver 100 rounds of each caliber ordered. Operated flawless, easy clean, appeared to be new brass and primers, no squibbs, or malfunctions. Will order more!!! shipping time was a surprise. We will order this again for sure. Ammo Man has our business. Great ammo for practice, shoot clean. Shot over 400 rounds. No FTL's or FTE's. Shot in multiple guns with no problem! Great ammo. Arrived within days of ordering. No issues with this great ammo. Took 3 days to get here. No complaints. Good target ammo. Clean, reliable and pretty accurate! No FTF or FTE issues after 500 rds. Bought and stored this ammo. I have purchased this ammo at higher prices elsewhere and couldn't pass up a great price from ammoman. First time buying from Ammo man and what a great experience. Ammo arrived a couple days after ordering (love the fact that shipping is included with orders over $99.) I have only shot a couple of boxes so far, but no FTF or FTE - my Glock just chews through this ammo without issue. I will definitely purchase ammo from AmmoMan again! Have used 100 rounds and got excellent performance. Weapon very clean vs residue from less expensive ammo. quality Federal ammo at a great price, seems a little hot, I was looking for a good training load that matched my carry load and this ammo is perfect. Got these on special. Flawless in my Ruger LC9s. I will buy again as needed special or not. First time I have ordered from Ammoman.com. Fantastic experience. Easy to order. Incredibly fast and free shipping. I have to fight the temptation to go shoot all 1000 rounds at the range tomorrow. Have shot this ammo many many times and it's good clean target ammo.